But really, watching live TV is so old-fashioned. The odds of there being something good on TV at the same time I want to watch TV are pretty slim, from what I’ve seen. And with just a few channels, it means that I watch live TV pretty rarely. Instead, I use my computer. Hulu is nothing new, and I just signed up for Netflix, not to rent DVDs but to stream movies and TV shows over the Internet. With a DVI-to-HDMI converter, I can make my TV a full-HD “monitor” for my computer and play things there. 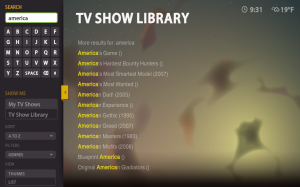 With the new Boxee Beta release, you can search by name, without having to care where the video is from. 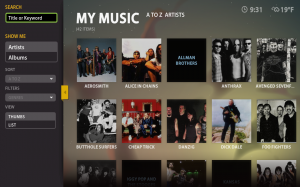 It’ll search all its sources for shows and allow you to pick which source you want to use. 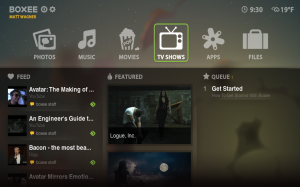 My one real complaint isn’t Boxee’s fault at all: there’s not a lot of good content available. Many studios are reluctant to post anything online. 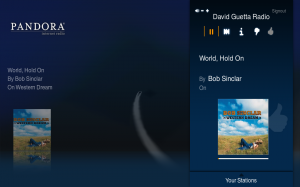 Hulu is by far the best, but there’s bad blood between Hulu and Boxee, with many studios demanding that Hulu not permit set-top clients, but Boxee managing to embed the browser inside Boxee. The episodes available online aren’t always the most recent, and there’s rarely a full selection. I did pair it with my $9/month Netflix collection to expand my options, though: suddenly, I can choose from thousands of movies and a handful of TV shows, and start watching in less time than it’d take me to dig the DVD off a shelf and load it into a DVD player. Overall, though, Boxee gets an A+ in my book. It’s really a pretty amazing product, and it’s free. But what I really want is the Boxee Box, an HTPC dedicated to running Boxee. (It happens to look amazing, too.) It won’t be available until later this year, sadly. Rumors put it at a mere $200; if that’s accurate, I’m ordering one the day they become available. I love Boxee on my laptop, but having a dedicated device would be so much better. In the meantime, sign up and download Boxee for your computer. You’ll thank me later. The problem for Apple is that there was so much hype and speculation that their product, in many peoples’ eyes, didn’t live up to the rumors. One reporter called it an “oversized iPod Touch” to explain why they were disappointed by it. And indeed, it was disappointing. Among the rumored features: background app support (so you could have one application running in the background while using another, and switching effortlessly between them), a video camera with video chat support, and, long overdue, the ability to display Flash applets on things. None were implemented. But despite being a little bit of a letdown, I still want one. I’m not going to run out and impulse-buy one for $500, but it’s certainly earned a spot on my gadget wish-list. I know a lot of people who have said they don’t see the point. But here’s what I see in it. I have a B&N Nook. It’s pretty amazing. I have lots of PDFs and a few books on it. When taking the train in, I sometimes purchase a copy of the LA Times or New York Times for 75 cents on the Nook, and get the day’s news. (Boston Globe: I’d totally buy your paper instead, if only you offered it on the Nook.) But current e-readers have some shortcomings. For one, as beautiful as the e-ink screen is, it’s a pain to use. I brought my Nook into work and a few coworkers were trying it out. They all did the same thing I keep instinctively trying: they touched the e-ink screen to select things, and swiped their finger across the screen to advance to the next page. And waiting 1-2 seconds for the screen to redraw is infuriating if you’re into what you’re reading, or if you’re a fast reader. This isn’t a Nook shortcoming, as much as a shortcoming of e-book readers as a whole. I also find I want a web browser. The Kindle has one, though I’m told it’s a bit persnickety and not all a “real” browser like modern smartphones have. (i.e., the pages don’t look anything like you’d see on a normal computer.) I have my iPhone for browsing, though when I’m holding a much bigger screen, it’s kind of annoying to have to have to switch to the iPhone’s seemingly-tiny screen to browse the web. For non-geeky computer users, I think the iPad could even replace a conventional computer. A lot of people don’t do much beyond checking email and browsing the web. If the iPad weren’t hamstrung by not being able to do Flash, that alone might make it worthwhile for some people. Add in support for iPhone apps, stellar mapping, an impressive photo browser, the ability to play music and movies, and the ability to read e-books, and it’s really a pretty nifty device. The iPad could be better, and it is a bit disappointing compared to the rumors. But I still think it’s a pretty useful device. If you’re not a Boxee user, you need to change that ASAP. 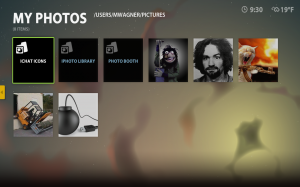 It’s software meant to form a sort of HTPC, bringing all sorts of free media together in a totally awesome interface. It runs on all major platforms, including not just Linux, Windows, and Mac, but also things like the Apple TV. Just don’t get in front of me in the line for a Boxee Box. The Watertown (MA) RMV is in the Watertown Mall. If you drove by ten times looking for a sign but didn’t see one, that’s because there isn’t one. Tuesday at 1pm is not a time when no one is at the RMV. If your ticket indicates a 33 minute wait, but you worry that the wait might be shorter and thus don’t want to walk to the other end of the mall to grab lunch, don’t worry. Your wait will be considerably more than 33 minutes. If you’re buying a car from a family member, see this page. You may be exempt from sales tax. This saved me a tremendous amount of money, but isn’t mentioned anywhere that you’ll find on the main RMV page about registering a vehicle. Even after at least two hours of researching what was needed on their site, I didn’t know until the attendant at the RMV asked me why I hadn’t filed one. The field on your RMV-1 form asking for your vehicle’s weight should not be filled in. If you were confused because that’s not mentioned anywhere, don’t worry: it’s not mentioned anywhere. The RMV attendant will confirm, in a condescending manner, that you shouldn’t fill it in. When you’re told that she can’t submit your application until you have all three documents and you say you’ll come back another day since you don’t have the required materials, she’ll still submit your application for a license, leaving you extremely confused about the status of your license. I learned a few things. The first is that the police need to be really specific about certain things in their reports, because trivial-sounding details can sometimes be really important. Other times, police perform seemingly silly procedures and document them, to cover themselves. So reports sometimes include paragraphs upon paragraphs of really boring details about who did what, and what other officers did the same and confirmed it and who witnessed what. […] Officers then examined the suspect’s mouth and were able to recover several pieces of crack cocaine he had secreted in his mouth a brief struggle. After officers placed the suspect under arrest, they looked around to see if the suspect had discarded any other drugs. While looking for other discarded drugs, officers located a firearm under the front on the front passenger side tire of a nearby parked car. While the officers were recovering the handgun, officers that were speaking to witnesses learned that the suspect had been seen hiding the gun under the front passenger tire. A canine confirmed the location of the gun along with a thermal imager. But that’s nothing compared to the next paragraph. For one, secrete is an ambiguous term. While their usage isn’t incorrect, I’m not sure why “hidden” or “concealed” was deemed unacceptable right there. I thought of secrete in the scientific sense, in which a liquid or goo oozes out of something, like some disgusting critter secreting slime. I confess to not being too knowledgeable about how cocaine is made, but I’m pretty certain that it is not through secretion, and that, if it were, you couldn’t arrest someone for secreting it. After recovering the firearm, a gun-sniffing dog was called in. He found the gun on or under the tire, which is pretty impressive since it sounds like the officers had already recovered the gun. What happens next is also confusing. The way I read it the first time, it sounds like, after the gun had been found twice, officers then brought in a thermal imaging camera to look for the gun, which they proceeded to find for a third time on or under the tire. But reading the story a second time, I realized that I may have misread it, since it certainly didn’t make much sense. The last sentence is a bit ambiguous, but I think a truer explanation would be that the gun-sniffing dog, while sniffing on or under the tire, found both a twice-recovered handgun and a thermal imaging camera. I’m not sure why a gun-toting crack addict would be carrying, much less concealing secreting, a thermal imaging camera, but there are a lot of things I don’t understand in that story, so I’ll let it go. While the product is uninteresting, this Uncrate post makes me want to take up woodcarving. I have a block of wood from a $10 cheese platter, no artistic ability, and a pen knife. This sounds like a recipe for success. For probably at least a decade, rumors have occasionally popped up about Apple working on a new tablet device. This time, they’ve really taken, with mainstream news sources talking about it, too. All of the frenzy around a device that is still just a rumor led one newspaper article (I think that’s where I saw it?) to call the articles fanfic. There’s a widely-circulated image of the iPad / Mac Tablet that’s been deemed the “most official” one, which is kind of silly since it’s still a conceptual Photoshop. There’s little known about what the device will do, how much it will cost, or whether the thing is even a real product. So TechCrunch’s recent post, The Apple Tablet rumors the other blogs are afraid to publish, was an especially entertaining read. I saw an interesting idea recently. It was attributed to Bruce Schneier, though I can’t substantiate that. In general, people find it easiest to remember words, so most people’s password is essentially a word. This is bad, of course, since it’s easy for a computer to run through every word in the English language in a very short time. So it’s common to take a word and “mangle” it in some ways: password might become p@ssw0rd, which, while better than “password,” is not exactly hard to guess. Of course, the “rule” is just a starting point. It’s an excellent idea to deviate as you see fit. This is an interesting post. The police in Denmark have a really spiffy command post that they apparently upgraded in anticipation of all the heads of state coming to the climate summit in Copenhagen. It’s an all-Mac shop. What’s interesting to me more than anything, though, isn’t just that they use Macs, but that the police have an in-house development team to custom-brew software. (Software for specialized disciplines can be astronomically expensive, so there may actually be good fiscal sense in having your own development team… And you can’t beat the support when you can walk in and talk to the developers.) The desktops have 3x 1TB drives using RAID 5, used to mirror data from the servers. They apparently preferred the BSD kernel to Windows, and found that Macs were far easier to write code for than Linux or straight BSD systems, and since they were writing their own applications anyway, there wasn’t any reason to not use the Mac. Of course, being not just an Apple fanboy, but also an Obama fanboy, I found this equally as interesting: Obama’s a Mac user, and apparently has a kinda-cool Pacman decal on his laptop. I suppose the first part of what makes this interesting is that the President has a personal computer. There was a lot of buzz around the fact that he had a Blackberry, and now it turns out that he carries his Mac when he’s on the road, and uses the built-in webcam to chat with his family. Making it clear that they’re fanboys just like me, that site sells the spiffy external hard drives shown in the photo and the Pacman sticker he has on his. Of course, as has been pointed out before, it’s not like Obama’s apparent affections for Macs isn’t reciprocal. Only one will survive. I wonder who it will be. Both are very impressive-looking. Of course, when the Boxee Box comes out, the choice will be a lot easier.